This tab includes options affecting how the built-in tools behave. 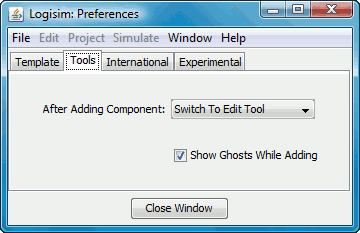 Show Ghosts While Adding: When checked, and when a tool for adding a new component is selected, a light-gray outline of a component to be added is drawn as the mouse moves across the canvas. For example, if you select the AND gate tool and move the mouse into the window (without pressing the mouse's button), a gray outline of an AND gate will display where the AND gate will appear when the mouse is clicked. Unselecting the check box will disable this behavior.